View Ste. Anne Church Historical Timeline. View a list of all priests and brothers who have served at Mackinac. Mackinac has a long, rich and fascinating history. This strategic cross roads of the upper Great Lakes has been home to Native Americans, European fur traders, soldiers of three nations, commercial fishermen and summer vacationers. Mackinac’s importance has ebbed and flowed over time. It has been a bustling, international port and an obscure, nearly deserted and very lonely northern Michigan outpost. As nations have come and gone, soldiers marched in and out, industries flourished and failed, there has been one constant since the 1670s — the presence of Roman Catholicism. 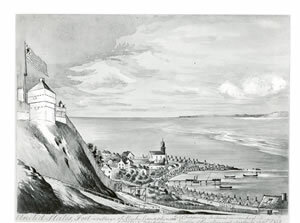 Roman Catholicism came to the Straits of Mackinac through the self-sacrificing efforts of Jesuit Missionaries. The early history of the entire Great Lakes region echoes with the names of Jesuit priests and brothers who traveled side-by-side, and sometimes ahead of, the first explorers and traders. With an unrelenting zeal to take the word of God to all people, men such as Jean de Brebeuf, Isaac Jogues, Charles Raymbault, Claude Allouez, Gabriel Druilletes, Rene Goupil and Claude Dablon journeyed to the far reaches of the Great Lakes and to the Straits of Mackinac in 1670. In that year, Father Jacques Marquette brought his refugee band of Huron Indians to the secluded safety of Mackinac Island. An agriculturally-based people, the Huron found the thin soil of Mackinac Island unsuitable for their crops. 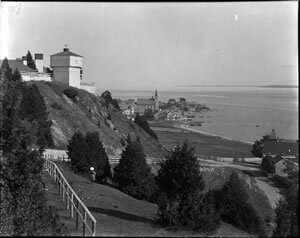 A year after settling on Mackinac Island, Marquette and his band of Hurons moved to the more fertile land on the north shore of the Straits. Here, Marquette and Father Claude Dablon founded the permanent mission of St. Ignatius Loyola (today St. Ignace, Michigan), named in honor of the founder of the Jesuit order. Nearby, the Jesuits also established the mission of St. Francis Borgia for the Ottawa Indians, another agricultural tribe who planted corn fields on the St. Ignace peninsula. A fur trade community developed adjacent to the missions and by 1690 soldiers constructed Fort Du Buade to protect French commercial interests. As the trade grew, Jesuit priests found themselves competing for the souls of the native people with traders offering beads, blankets and brandy. When the French military closed Fort Du Baude and later reestablished a Great Lakes presence at Detroit in 1701, the Huron from St. Ignace migrated south and became the Detroit-area Wyandots. 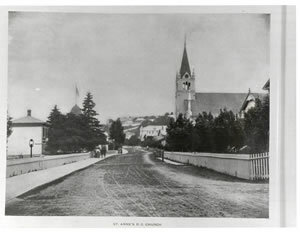 Left behind were the Jesuits and their faithful band of Ottawa still tilling the soil at the Straits of Mackinac. 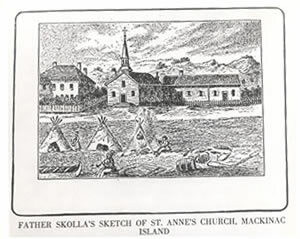 After depleting the soil at St. Ignace, the Ottawa and their Jesuit priests moved to the south shore of the Straits of Mackinac (today Mackinaw City, Michigan), sometime around 1708. In 1715 they were once again joined by French fur traders and soldiers who constructed the palisade community of Michilimackinac. The Jesuits soon found themselves ministering to both their Ottawa converts in the mission and the growing French-Canadian population in the adjacent community of Michilimackinac. Fulfilling their dual responsibility became more challenging for the Jesuits after 1741 when the Ottawa moved 20 miles south along the Lake Michigan shore to L’Arbre Croche where they established new crop fields. The Jesuits transferred their mission to L’Arbre Croche while continuing to serve the small but active Michilimackinac congregation. Now separated from the mission, the Michilimackinac congregation built a new church a few years later and named it “Ste. Anne’s,” in honor of the mother of the Virgin Mary. The residents of Michilimackinac had a special devotion to Ste. Anne, as she was the patron saint of voyageurs. 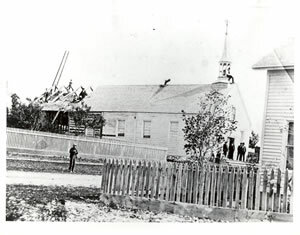 Despite the British conquest of Canada and occupation of Michilimackinac in 1761, the Church of Ste. Anne continued to flourish until Father Pierre DuJaunay was recalled four years later. The nearly unbroken presence of Jesuit missionaries in the Straits of Mackinac ended when DuJaunay closed the mission at L’Arbre Croche and left Michilimackinac in 1765. Without a shepherd, the flock continued to practice their religion as best they could. 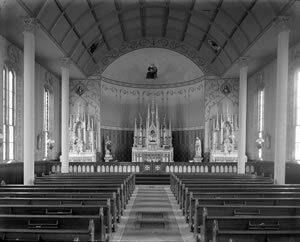 The faithful gathered for public prayers in the church, kept private devotions in their homes, used lay leaders to per form sacraments and looked forward to the occasional visit of a missionary priest. Parish leaders cared for the church and adjacent priest’s house - forever hopeful that a priest would return to their remote parish. 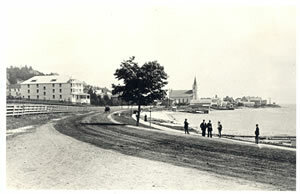 British authorities moved the Michilimackinac community to the safety of Mackinac Island during the American Revolution. Hoping to encourage the French-Canadian residents to move as well, Lieutenant Governor Patrick Sinclair ordered Ste. Anne Church dismantled and taken to the island in 1780. The sturdy log church was rebuilt along the shore of the island’s protected bay below the towering bluff that became home to the new fort. 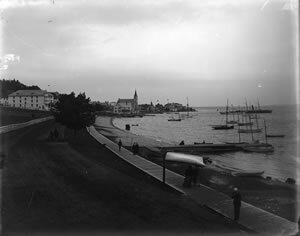 The congregation repeatedly petitioned church authorities to send a permanent priest to Mackinac. Their poignant appeal to Bishop John Carroll of Baltimore in 1804 expressed their deep desire for priestly ministry: “The innocence of the children, the weakness of the aged, the sins of the most vicious, all these demand the favor of your pastoral charity...to forestall the sad results of a flock straying without a shepherd.” A year earlier Father Gabriel Richard testified to the sad state of affairs at Mackinac when he learned that the church altar had been desecrated and the priest’s house turned into a public brothel. In desperation, Richard recommended that the church ornaments, books, portable altar and chalice be sent to Detroit rather than be spoiled or abused by the community. As church authorities sent only visiting clergy to Mackinac, it fell to the steadfast dedication of Ste. Anne’s parishioners to sustain the parish through these difficult times. Magdelaine Laframboise, a prominent Mackinac Island fur trader of mixed Ottawa and French blood, provided crucial leadership and support during the first half of the nineteenth century. Her devotion is well documented in the parish register where she frequently appears as a godmother to the baptized and witness at marriages. 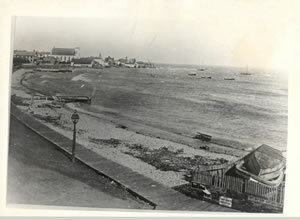 “Madame” Laframboise donated the property adjacent to her home when parish leaders decided to move the church and priest’s house from their original location in the village to the current site on the east side of the island harbor in the mid 1820s. In exchange for her gift of land, Laframboise asked to be buried beneath the altar at the end of her life. Father Henri Van Renterghem honored her request when she died in 1846. In November 1830 Ste. Anne’s parishioners warmly welcomed Father Samuel Mazzuchelli to Mackinac Island. A twenty-three-year old, Italian-born Dominican, Mazzuchelli was Ste. Anne’s first resident priest since 1765. With Laframboise’s assistance, Father Mazzuehelli started a catholic school for island children. Martha Tanner, who spent much of her adult life teaching Indian and Metis children at Mackinac and L’Arbre Croche, joined Josephine Marly as the school’s first teachers. Nearby, a Presbyterian mission under the direction of Reverend William Ferry likewise sought to attract young scholars to its classrooms. Conflict was inevitable. Although a flourishing fur trade attracted enough students for each school, Mazzuchelli and Ferry jealously guarded their congregations and competed to bring in new converts. Their antipathy climaxed in a series of theological debates in which both sides claimed minor victories. During the 1990's Ste Anne underwent structural updating and added the porch on the east side of the church.The tomb of Madame LaFramboise was situated in the peaceful garden and the museum created and opened to the public. In true renaissance fashion, a new mural depicting Ste's Anne, Mary and the baby Jesus with a view of Mackinac Island in the distance was created for the church. Photos courtesy of Mackinac State Historic Parks.